Whats that helicopter doing there you might ask? Using the Seine fishing method this is how they go about fishing for Tuna. A vessel such as the Capt M J SOUZA is known as a is purse seiner, or in her specific case a super seiner. The Capt. M.J. Souza is based in the Western and Central Pacific for most of the year. During the summer months the vessel fishes back in NZ around the top of the North Island for Skip Jack Tuna. Trip lengths can vary from 20 to 70 days depending on the fishing. Actually the spotting job is shared between this machine and the guy up in the spotting tower. Once a school of Tuna is spotted its all hands on deck as they use a high speed large dingy to tow the net out and encircle the fish. That’s the net you can see on the back of the boat. In the last few days a grand old lady of the skies has been in Nelson offering joy-flights. Quite amazing to learn that so many of these old girls were built. Old and new technology meet at Nelson Airport. With talk that jet travel is only going to get faster, and therefore distances shorter, its only natural to imagine that the air transport lanes in NZ are only going to get busier. Well as luck would have it, I just happened to be up on the hill today answering a phone call to help a potential seller ascertain what their home might be worth……and then when I got back in my car to leave………. …. I just couldn’t help but notice that the angle of the sun had shown the very noticeable difference in colour ………..
………between the Haven and the outside ocean……...by Ocean I mean the Tasman Sea on the other side of the Boulder Bank. I thought it was worthy of a snap or 2, for no other reason than I just love turquoise coloured water really. 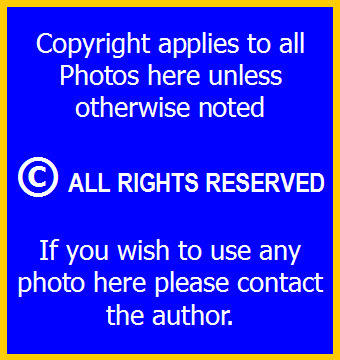 ……..the small photos ……well pls let me explain……I’ve just started using the latest version of Microsoft Windows Live Writer……...and until later……...this is just what it seems to do……..but just click on the photo for a larger version. This is the before shot……. Courtesy of its name, this local landmark has in the past actually been featured on international websites drawing attention to weird place names. 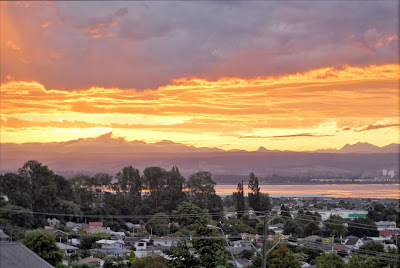 Its a great look out situated just above the southern area of Tahunanui. 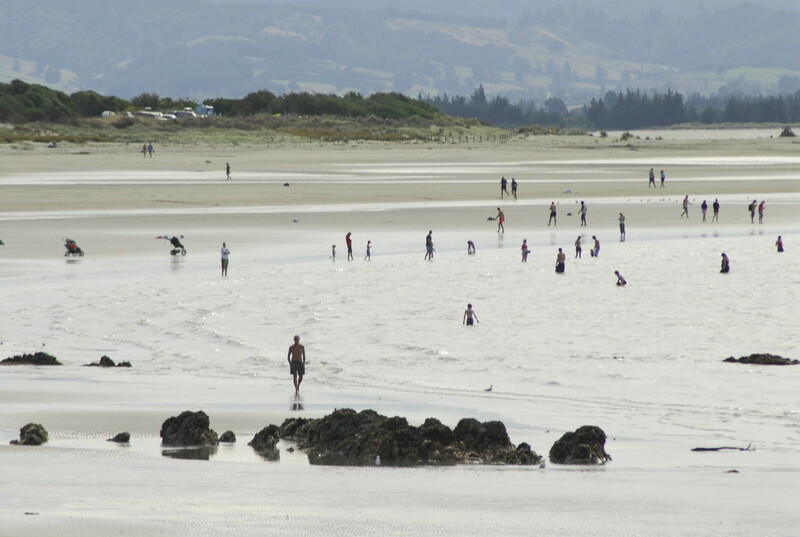 Affording views out over the water to the North, you can also see practically the whole of Tahunanui Beach and the back beach. To the west & south-west you view out over the airport, towards Blind Channel and Rabbit Island on to the hinterland that forms Upper Moutere and then to the Western Ranges in the distance. If you're curious about what the names of the different peaks are, they are marked out for you to see on 3 plagues dotted around the circumference of the lookout to aid you in identifying local landmarks. Last nights sunset was certainly, to coin a phrase, vivid. 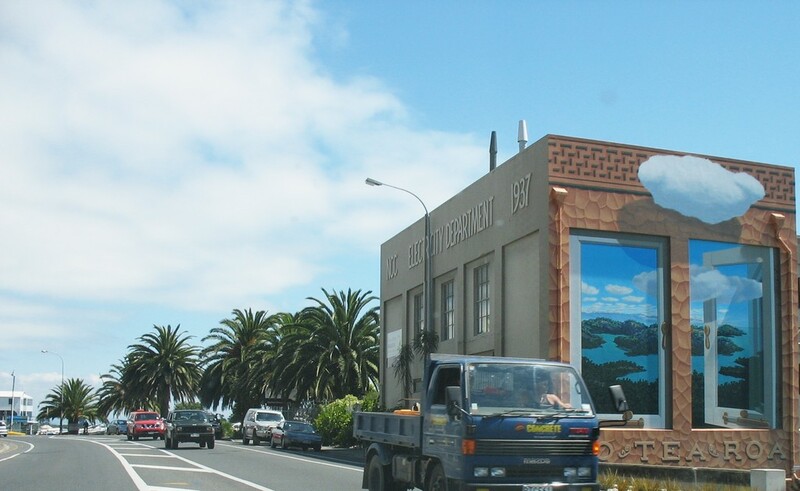 Most anyone, the first time, they travel around the Quay onwards in a southerly direction to Tahunanui take a second look at this fabulous mural. Originally painted around 1984, the toll from the elements was starting to show. 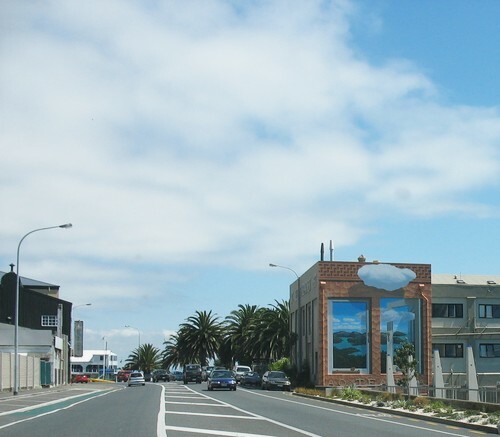 It was recently repainted, and the original artist, Chris Finlayson, was recommissioned to do it all over again. This time though Chris sought assistance from the local community, and dozens signed on to help, in what Chris described to the Nelson Mail as being like a "paint-by-numbers working bee for adults." tides we have been recently exposed to. high - 4.6m it was reported. actually taken advantage of it! got just a wee bit close for comfort these last few days! to the beginning of European settlement. and formed a settlement at Upper Moutere. and the farming of, were popular with the locals. The Japanese Drummers proved popular early on. It certainly was a festival weekend in the region. Over at Founders Heritage Park in Nelson yesterday, about 600 showed up for Jamaican Jump Up II, a celebration of Caribbean food. While over in Golden Bay yesterday, it was the unusual that brought them far and wide to the Collingwood Summer Food Fair. According to our local paper The Nelson Mail, if you so desired items like, roast pukeko, Stingray, barbecued sheep eyes, sheep brains, and pig testicles were all on the menu.